Ratchet straps are ideal for a number of tie-down applications, like securing loads to vehicles and keeping construction materials in place. 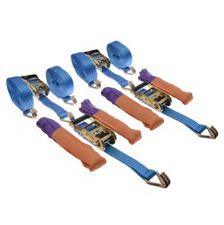 We offer a wide variety of ratchet straps to suit your needs. Our straps, made from high-quality and hard-wearing polyester, provide strength ratings from 250kg to 10,000kg with lengths up to 20 metres. These straps have been divided into two sections; over 3,000kg and below 3,000kg, so that you can easily find what you need. Our D-ring ratchets allow you to attach them to the hooks mounted to the walls and floors of your lorry with ease. Its one-hand tensioning and quick release mechanism makes it simple and effective to use. While our mini ratchets are perfect for smaller applications like securing canoes or kayaks to car roof racks, or motorcycles to trailers. Our range of Vehicle Recovery Sets provide all the equipment needed to recover vehicles up to 5 tonne maximum break strength; enough to tow a small heavy goods vehicle. The Easy Winder has a windable handle so that you can tighten your ratchet strap quickly and easily. Wear sleeves are made from hard-wearing, flexible rubber in order to protect ratchets from abrasions. They are particularly useful on sections where heavy loads are most taking their toll. 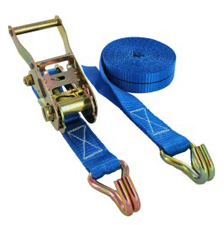 Here at The Ratchet Shop, we offer a wide variety of ratchet straps to suit your needs. 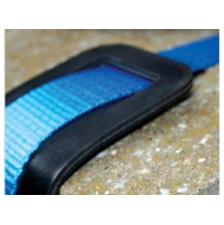 Our straps, made from high-quality and hard-wearing polyester, provide strength ratings from 1,500kg to 10,000kg and lengths up to 20 metres. 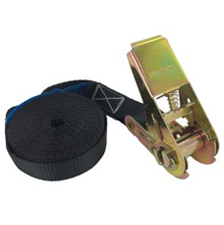 These are ideal for a number of tie-down applications, like securing loads to vehicles and keeping construction materials in place. Our D-ring ratchets allow you to attach them to the hooks mounted to the walls and floors of your lorry with ease. Its one-hand tensioning and quick release mechanism makes it simple and effective to use. Our mini ratchets are perfect for smaller applications like securing canoes or kayaks to car roof racks, or motorcycles to trailers. Our vehicle recovery sets go up to 5 tonne maximum break strength; enough to tow a small heavy goods vehicle. 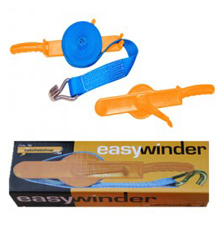 We also offer the Easy Winder; a windable handle you attach to your ratchet strap, making it easier to tighten.